As if we really needed this reinforced…Oh wait maybe we do. Well Here it is from Mr. Cutts himself. Since then, we showed one case where Google not only discovers the links within typical press releases but uses the anchor text for ranking purposes. Maybe it was one fluke or maybe that particular case was not fair? The other day, Daniel Tan released another press release, this time on a smaller release siteand added the anchor text “leasreepressmm” pointing to the blog of Matt Cutts. His goal was to get Matt’s blog to rank for leasreepressmm and guess what, it worked. 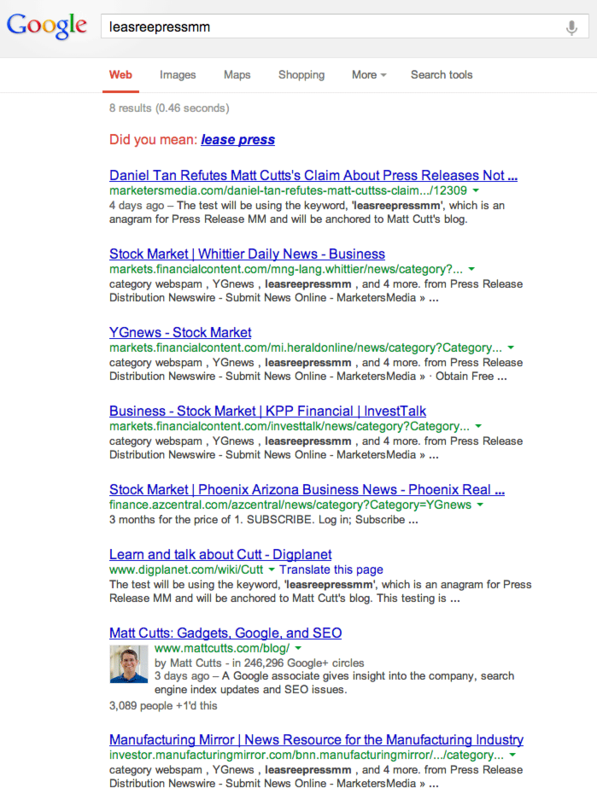 A search in Google for [leasreepressmm] returns Matt’s blog as number seven for me right now, only a few days after the press release was posted. Of course, Matt could have meant it wouldn’t “benefit your rankings” for more competitive search terms?